In nature there are no synthetic supplements, so dogs and wolves derive their complete nutritional needs naturally, by consuming whole prey animals. 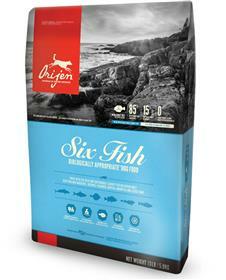 Made with fresh whole fish, ORIJEN SIX FISH provides a richly nourishing and concentrated source of virtually every nutrient your dog needs to thrive, naturally, without long lists of synthetic supplements, so only zinc and copper are added. Ingredients:Whole atlantic mackerel, whole atlantic herring, whole atlantic ﬂounder, whole acadian redﬁsh, atlantic monkﬁsh, whole silver hake, mackerel meal, herring meal, blue whiting meal, herring oil, whole green peas, whole navy beans, whole red lentils, alaskan cod meal, pollock meal, sunﬂower oil, whole yellow peas, whole pinto beans, whole chickpeas, whole green lentils, lentil ﬁber, natural ﬁsh ﬂavor, safflower oil, freeze-dried cod liver, whole pumpkin, whole butternut squash, kale, spinach, mustard greens, collard greens, turnip greens, whole carrots, whole apples, whole pears, dried kelp, pumpkin seeds, sunﬂower seeds, zinc proteinate, mixed tocopherols (preservative), copper proteinate, chicory root, turmeric, sarsaparilla root, althea root, rosehips, juniper berries, dried lactobacillus acidophilus fermentation product, dried biﬁdobacterium animalis fermentation product, dried lactobacillus casei fermentation product. My 3 German shepherds love Orijen food!!! My dogs are on a raw diet however I'll occasionally by the small bags of Orijen kibble and use them to fill their treat balls. I had a hard time finding healthy treats small enough for their treat balls so this is a tasty and healthy alternative.